Regularly scheduled Acela Express service began on the Northeast Corridor (NEC) between Washington, New York and Boston on December 11, 2000. Through February, Amtrak will mark the anniversary with special “Acelabrations” for customers and employees. Surprises on the trains, in stations and elsewhere are planned as Amtrak pauses to celebrate this milestone. In a series of blog posts (read Part 1 and Part 2), we’ll take a look back at the journey to Acela Express and explore its future. 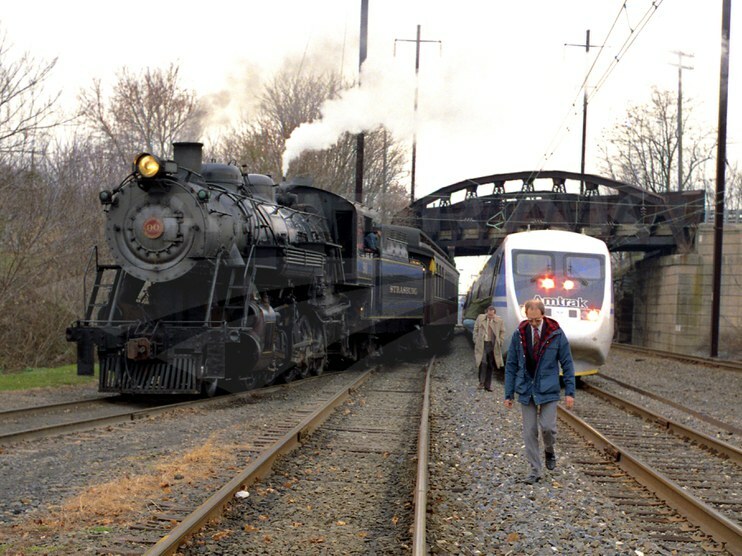 The X2000 (r) makes test runs in December, 1992, near Leaman Place, Pa., where the heritage Strasburg Rail Road connects with the Keystone Corridor. As Amtrak looked into the development of modern high-speed rail in the early 1990s, it leased two European high-speed electric trainsets for testing and revenue service on the Northeast Corridor (NEC) between Washington and New Haven, Conn., in 1992-1993: the Swedish X2000 and the German Inter City Express (ICE). They were chosen because both could travel at higher speeds than conventional trains on existing main line track; unlike contemporary French and Japanese high-speed trainsets, they did not require new, dedicated tracks. During testing on the NEC, the X2000 achieved a speed of 1551 mph and the ICE reached 165 mph.2 The equipment was also put on display in cities across the country. 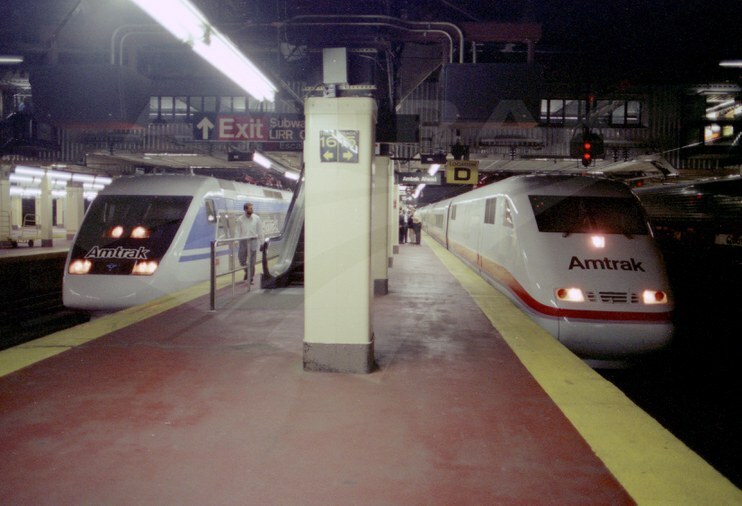 The high-speed InterCity Express (r) and X2000 trainsets share the platform at New York Penn Station in August 1993. The X2000 had been designed and built by Asea Brown Boveri, Inc. (ABB) for the Swedish State Railways (SJ). Promotional material noted that the X2000 had “new generation AC electric propulsion systems” that permitted faster acceleration; “radial self-steering trucks [that] contain individual wheelsets and axles that steer themselves around curves,” thereby permitting faster speeds around curves than with conventional equipment; and tilt technology that allowed the passenger cars to lean into curves and counterbalance centrifugal forces for passenger comfort. The X2000 sent to the United States consisted of a power car, three coaches, a bistro car, and a cab car. While on a run from Milwaukee to Minneapolis in July 1993, the X2000 made a stop at Red Wing, Minn., a station on the route of the Empire Builder. As part of the lease agreement, SJ sent personnel to train Amtrak engineers on how to run the equipment. One of those Swedish engineers was Ingwar Afeldt, who had joined SJ in 1964 as a bus driver. In January 1975, Afeldt was transferred to train service and employed as an assisting engineer; by October 1976 he had become a locomotive engineer. “I worked on all kinds of trains - passenger, freight and commuter - electric and diesel,” he recalls. Afeldt was sent to Switzerland in 1986 to assist Ascom, a manufacturer who had received an order from the Swedish and Norwegian state railways for a new advanced train radio system. 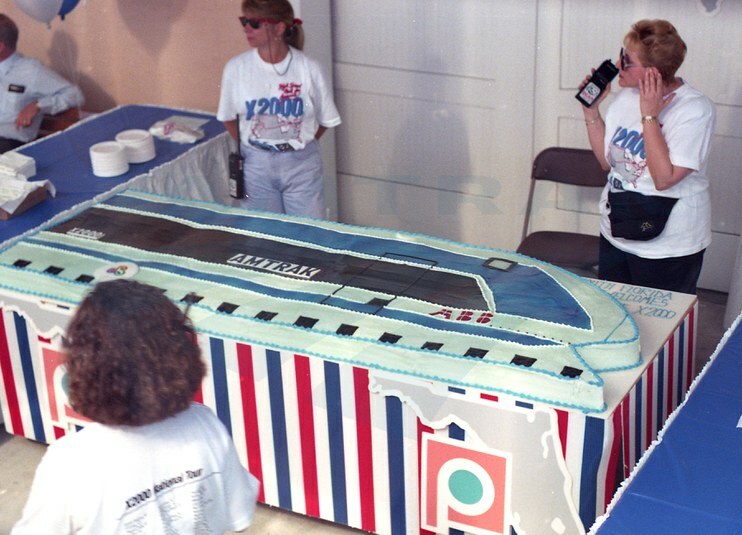 During a stop at the historic West Palm Beach, Fla., station on June 4, 1993, rail advocates served a cake shaped like the X2000. When the X2000 entered scheduled revenue service on the 283 mile route between Stockholm and Gothenburg in September 1990, Afeldt was one of two engineers on the initial trip. 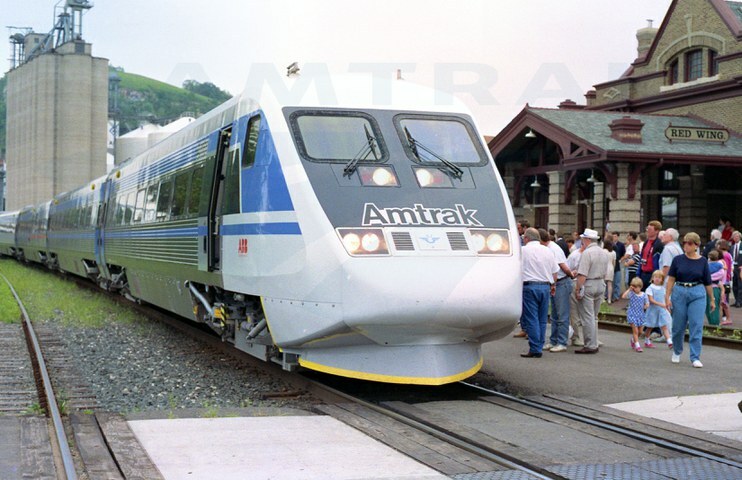 A pamphlet published by ABB and Amtrak noted that conventional trains on the route took about four-and-a-half hours, but the X2000 reduced the running time to approximately three hours. He and his colleagues then operated the train for the next five months. At the end of that period they also instructed other engineers on the train who then took over their operation in revenue service. Afeldt recalls that Amtrak staff arrived in Sweden in early summer 1992 to examine the X2000. “I followed them when they rode the train in revenue service. I was later told by my boss that I was going to go to the U.S. with the X2000. Amtrak had leased it and, as I was told, they had ‘leased’ me too!” He instructed Amtrak road foremen and engineers on operation of the X2000. “Since the training was very short, compared with the training of the Swedish engineers, I also had to be in the cab all the time when the train was moving.” Afeldt would spend 10 months with Amtrak. 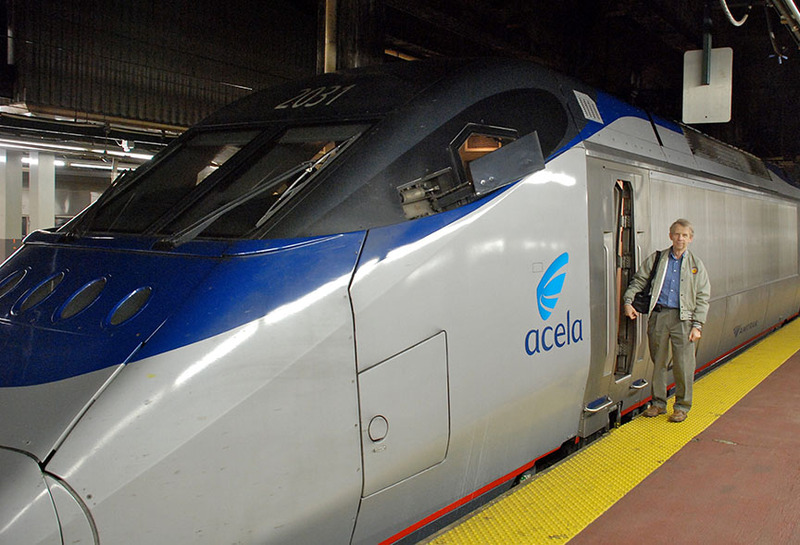 Ingwar Afeldt poses with the Acela Express in Nov. 2010. In addition to using the X2000 in revenue service on the NEC, it also went on tours of the United States and Canada so that the North American public could get a look at the latest in high-speed train technology. Outside of the electrified NEC, the train was pulled by diesel locomotives familiar to passengers of Amtrak national network trains. All images but the last taken by Ingwar Afeldt to record the X2000 American tour and his time with Amtrak. See additional images by Afeldt in the Amtrak Archives. 1 I. Afeldt, personal communication, December 14, 2015. 2 R. Clifford Black, “The Acela Express,” Japan Railway & Transport Review, March 2005.